The restaurant space now occupied by Oliva used to be a peruvian restaurant that I really wanted to go to a couple weeks before it closed. Thank goodness they didn’t have any vegetarian items on the menu preventing me from going with a vegetarian friend because that place got closed down for health reasons. Since then I have wanted to give Oliva a try but it has gotten mixed reviews. I have had a couple friends go there and have mediocre experiences. So when I went I didn’t have high expectations. The decor is interesting considering it is a Mediterranean and Italian restaurant. Bunky’s does this combo really well and has very eclectic decor. Oliva is an odd combination of modern and floral patterns, and muted tones throughout. It felt more like a funky coffee shop than a restaurant. I was really unimpressed by the plastic glasses that my water came in but the steamy hot bread was amazing. The menu is mega long and complex with way too many options that lack in diversity. They offer pizzas, pasta, salads, entrees, and calzones. 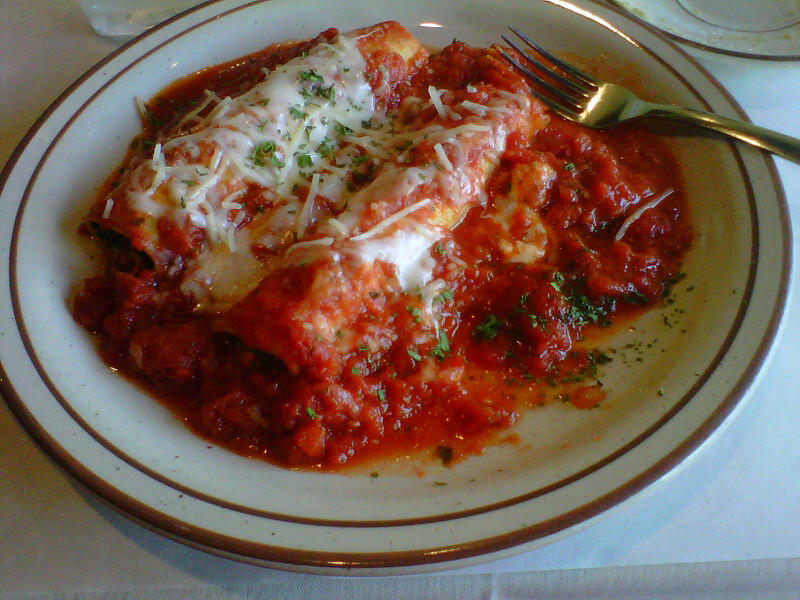 I got the cannelloni which was supposed to have ground beef in it but I couldn’t see or taste any in mine. The dish came out piping hot and the marinara sauce had a really great flavor. I was a little disappointed in the size of the dish and the lack of beef for the price. Everything on the menu could be about $4-$6 less and then this place would be a great deal. The prices were also disappointing considering the plastic glasses. The dessert options are pretty general with tiramisu, baklava, cheese cake, and rice pudding as options. I got the baklava which was a good size for the price but the usually honey-like sauce had been replaced with a thin sugary sauce. I liked the ratio of nuts to phyllo dough but I missed the traditional thick sauce of other baklava’s I’ve had. Bottom Line: It was a good meal but a little disappointing for the price. The decor was off-putting and the plastic glasses bothered me (they felt cheap). After looking at the menu again I don’t think there’s anything on the menu that would bring me back.